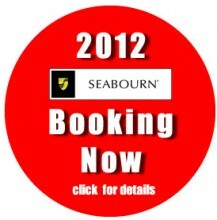 Deluxe Cruises are pleased to announce that Seabourn 2012 voyages are now available to book. Booking early ensures you have the best selection of suites at prices which will probably be going up. The Seabourn Quest joins her other two sisters – Odyssey and Sojourn in the Seabourn fleet in June, 2011. Voyages have been fully loaded on our web site, but if you need personal advice, pricing or availablity, please call Deluxe Cruises today. Please ask about special offers of Seabourn 2011 cruises and our April Savings promotion.